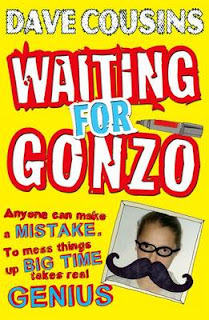 I really loved Waiting For Gonzo by Dave Cousins. I haven't yet read the author's previous book but I certainly will after I enjoyed this book so much. I wasn't sure at the start about this book, as it didn't to have much structure to it, I didn't really know where the story was going until a fair ways into it. But what kept me reading was the really believeable and humourous teenage voice and also some great characters. Right from the start, I was pretty intrigued by the title of the book and while there are some clues throughout, I didn't fully get the meaning of it until about halfway through the book. Until then, I assumed that the main character, Oz, was talking to a friend, filling him in on details of his life. It makes sense as Oz and his family have moved away from their home and friends and school to live in this small village and Oz isn't having a great time of it. In fact, Oz is pretty good at being a bit of an idiot and making mistakes and bad decisions, but he's pretty funny and incredibly likeable right from the start so I didn't hold it against him. Oz's first day of school and he incurs the wrath of a psycho girl who also turns out to be his neighbour and from there things just start to escalate in Oz's world. With new friendships and Psycho Girl's involvement with his family, a stolen phone leads to the humiliation of a new friend and that's just the start of it. It was quite fun going along with Oz on this weird journey. And while I loved Oz throughout, it was also nice to watch as he starts to see things and the people around him in new ways, even while screwing up constantly. My favourite part of the whole story is Oz's relationship with his sister. They bicker and call each other names but there's also a great connection between the two of them that I really loved. While Waiting For Gonzo is really funny, it's also quite a sweet story that touches on more serious things. I'm really glad to have this book and really recommend it! Did you? That's because you're clever! But definitely, the journey through the book is what counts, and it was pretty amazing!